You’ve heard experts rave about the importance of nitric oxide and how it helps you build muscles. Now, the verdict is out. Nitric Oxide boosters definitely help you build muscle. The question now is – what nitric oxide booster should you take? 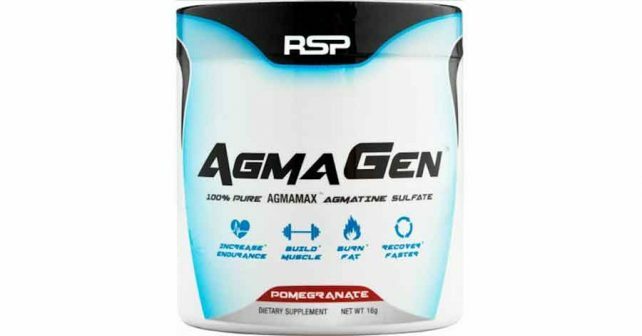 RSP Nutrition claims to have the solution with their Agmatine Sulfate supplement, AgmaGen. AgmaGen is a 100% Pure Agmamax Agmatine Sulfate formula that helps to increase nitric oxide production for increased muscle pump and nutrient transport. This is in direct contrast with other supplements that use L-Arginine and L-Citrulline to facilitate a better transport system for nutrients. Is Agmatine Sulfate better than most nitric oxide boosters? Read the rest of our review to find out. Agmatine Sulfate is a nitric oxide booster. Nitric oxide is important to build muscles because it helps dilate blood vessels, a function that allows more blood to pass through the arteries. An improved blood flow allows more nutrients to be absorbed by the different parts of your body, including your muscles. Agmatine is derived from L-arginine through decarboxylation, but nutrition experts advice strongly against combining Agmatine with other vasodilators like L-Arginine, L-Citrulline, and Yohimbe. Who uses RSP Nutrition AgmaGen? Nitric oxide boosters are primarily used for the “pump” or the tight feeling in your muscles following a muscle-building exercise. The pump is produced by an increased blood flow to your muscles, making your muscles feel fuller and tighter. Nitric oxide boosters are used also as recovery agents and strength boosters to amplify workout performance. We measured the effectiveness of RSP Nutrition AgmaGen based on other nitric oxide boosters that we have found to be effective. In comparison, Agmatine Sulfate isn’t as “friendly” with other supplements. In fact, it can even work against other supplements that boost your other functions to support muscle growth. It is known to counteract the effects of D-Aspartic Acid, a testosterone booster, and Creatine, a supplement that helps boost workout strength and endurance. As much as Agmatine sulfate is incompatible with other supplements, it can do some functions that other supplements cannot, like reducing pain. Although agmatine supplementation can increase the perception of pain, it works hand-in-hand with painkillers like fentanyl. The synergy of Agmatine with opioids make it possible to reduce the possibility of painkiller addiction and tolerance, and ultimately, pain itself. Taking RSP Nutrition AgmaGen is depends solely on what you need as an athlete. At the very least, you would be giving up Creatine and D-Aspartic Acid, two of the most important supplements for a bodybuilder. If anything, taking RSP Nutrition AgmaGen can help you if your goal is to reduce muscle and neuropathic pain as a result of your exercise. However, pain is something you should address with a trainer or a physician since pain is a sign that you’re doing something wrong, or you shouldn’t be doing a kind of exercise at all. The best muscle building supplements are always stackable with other supplements. That’s why we are particularly fond of NitroGenix 365 with L-Arginine. NitroGenix 365 contains different types of L-Arginine, which can be stacked with testosterone boosters (Xtreme Testosterone) and all types of Creatine. Check it out.